The production, with lyrics and book by Laurence O’Keefe and Kevin Murphy, is an adaptation of the 1980’s cult classic film “Heathers” (1988) that detail the experiences of outcast Veronica Sawyer, played by Olivia Coughlin ’20. Sawyer struggles to survive in the vicious social scene of Westerburg High School. 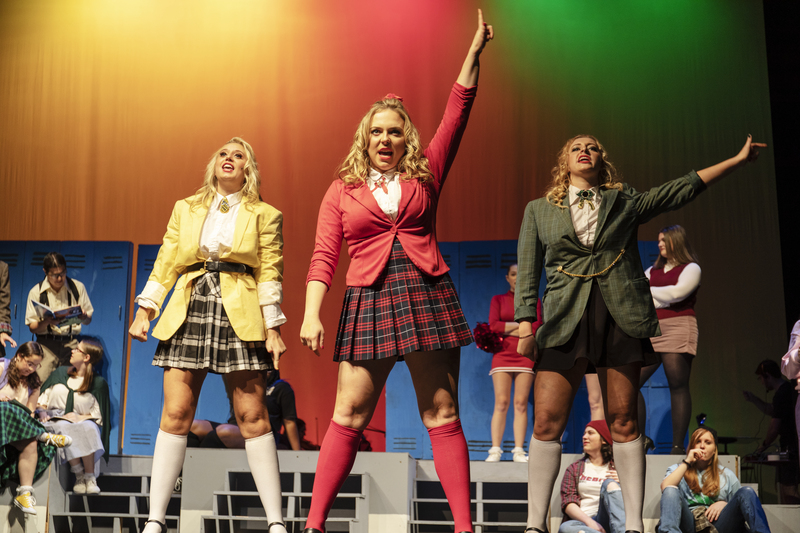 The mixture of very black comedy and genuine social commentary central to the story of “Heathers” could present a tonal obstacle for a weaker group, but the Players’ production, directed by Anna Pohoryles ’19, absolutely rises to the challenge. At the top of Westerburg’s social hierarchy are the titular Heathers: a trio of rich, uber-popular girls, each named Heather. Queen bee Heather Chandler, played by Lauren Stango ’22, leads the group. The Heathers spend their time forging love letters and playing croquet. In the show’s presentation of high school Hell, Chandler is seemingly Satan herself. Stango’s portrayal of Chandler clearly stands out as the star performance. She injects such vivacity into each of Chandler’s lines and actions that audiences will surely delight in hating her. The story kicks off when Chandler gives Sawyer the opportunity to join the Heathers. Against this John Hughes-esque storyline comes the entrance of JD, played by Keenan Barr ’21. JD is a troubled, violent rebel whom Sawyer quickly falls for. Paired together, Sawyer and JD embark on a war against Westerburg’s social hierarchy, which they view as emblematic of deeper cultural failings. With tight comedic timing and a fantastic mix of off-handed remarks and individual humorous moments, the production treats its delicate subjects with levity, managing to be enjoyable while tackling its serious subject matter. The show’s production elements are a particular highlight. Both lighting and set design are consistently creative. Additionally, each cast member is highlighted through strong choreography and energized deliveries. Through the guise of a bloody high school drama, “Heathers” offers commentary on our own image-obsessed culture. “Heathers” is not without weaknesses, however. Despite their strong on-stage chemistry together, Coughlin and Barr falter at points, occasionally unable to support the full dramatic weight of certain moments. In its narrative, the show shares a flaw with the original film, with its second act not quite matching the shocking energy of the first. Yet, in full, “Heathers” is a triumphant effort from the Marquis Players, balancing dark comedy with violent drama to maximum effect. If you have the chance to check this show out, I strongly recommend you take it. Tickets are $5 and shows will be held at the Williams Center for the Arts at 7 p.m. on April 11 and 12, and 2 p.m. on April 13. The show opened yesterday, with the Marquis Players holding a talk-back afterwards to discuss the show’s heavy themes.